) repor från en katt? hela.dagen: ja, en av våra kattungar bestämde sig för att hoppa upp på mig igår. har fler märken på högerarmen och kinden, haha. What a wonderful capture. Its amazing you kept the serenity of a Sunday morning. why are most of your pictures of your bony neck? thanks guys, you're so sweet! anonymous: that's a bit of an exaggeration? I guess I like necks, to me this part of the body is the most beautiful. Are those scratches gifts from the cat on the floor? There is something beautiful about them (I have a curious fascination with scratches & paper cuts & pinpricks), almost poetic. & I love how faint they are, that they could possibly disappear if I blink. The lighting is beautiful. Definitely looks & feels like morning. Winter, too! I am so happy you are taking photographs again; I have missed your work, your voice. Beautiful photo, cat and the patterns!! 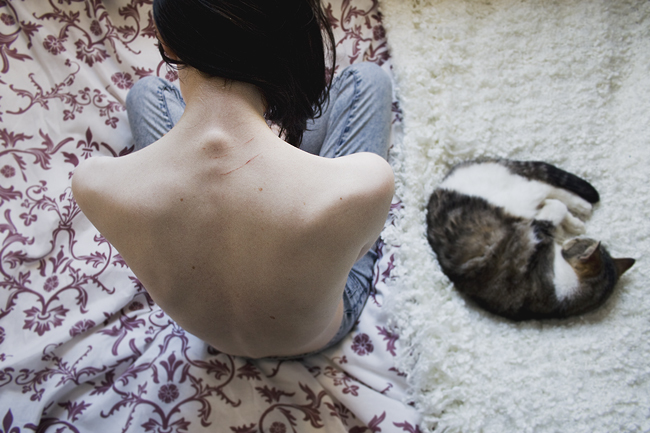 wow your photos never cease to amaze me..
and I agree, scratches on skin are absolutely beautiful. I'm so glad I have the time to shoot again, I've missed it so much. thank you! and I noticed you have a tumblr now, it looks beautiful! I'll be following you. I'm so infatuated with your work its ridiculous. Åh vilken fin bild, fantastiskt ljus som vanligt och perfekt komposition- du upphör aldrig att inspirera! zayna: thank you so much! roadluna: I'm hoping I can be more active again from now on :) and yes, this is digital. hihi, thankfully it wasn't too painful though - it "burned" for a while, especially on my cheek were it bled the most.